In October of 2017, I had the opportunity to present a talk at a symposium as part of the Johnny Cash Heritage Festival held at Johnny Cash's childhood home in Dyess, Arkansas. The talk focused on analyzing trends in Johnny Cash's lyrics and specific audio qualities in his music. I covered analyzing his lyrics in a previous post. This post, Part 2, analyzes specific audio qualities in his music. "Rick really did succeed in what he set out to do: he got the honest, unadulterated essence of Johnny Cash, whatever that is." By the end of this project, I listened to 72 Johnny Cash albums which included 856 unique recordings across mainstream, live, gospel, soundtrack and Christmas material. For the most part, I tried listening to albums in the order of first release as if I was a new Johnny Cash fan listening from beginning to end. As I went along, I developed an intuitive sense around how his sound changed over time. Johnny Cash released hit songs in each of the six decades he recorded music. Even a casual listener can spot the obvious differences in production and musical presentation as these songs span major periods in his career. However, using audio analysis, we can move from broad generalizations about the acoustic qualities of his music to something more measurable. Digital music has long been a preferred format for the mass listening audience. It's likely most everyone listening to music today recognizes the image below as a waveform. This waveform represents a mono recording of Johnny Cash's Folsom Prison Blues where the oscillations in amplitude represent changes in the input signal over time. Just looking at the waveform, we can infer attributes about the recorded material like volume, total duration or get a sense of tempo. For more detailed analysis of an audio signal, we can use spectrum analysis to render volume levels of specific frequency bands. Combining spectral analysis with machine learning, we can derive high-level audio attributes such as energy, tempo or loudness. As an example, here's Johnny Cash's ten most energetic songs. 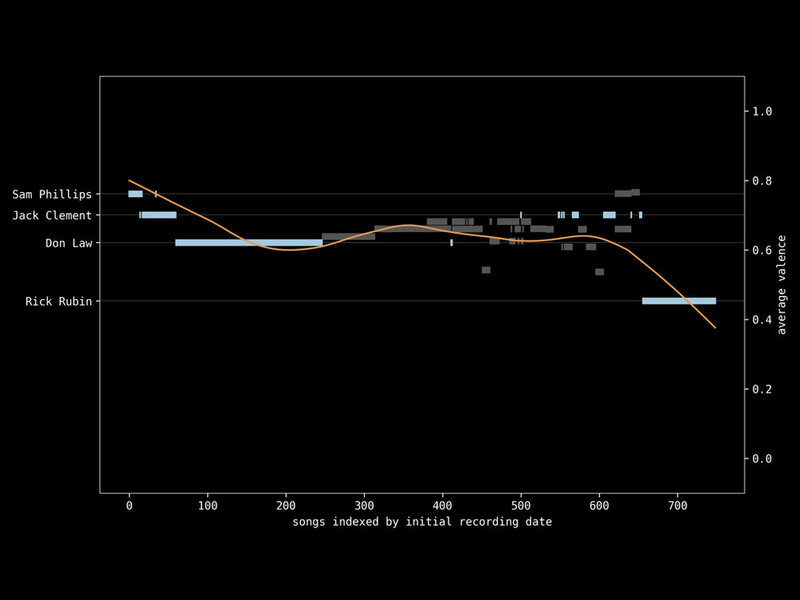 To understand how Johnny Cash's music evolved, we can select specific audio attributes and plot them over time. Let's start with energy. Rather than measure each individual track, we'll group tracks by their album and take their average energy. To order albums over time, we'll use the average initial recording date of each track as the album's mean recording date. Here's how Johnny Cash's musical energy changed from album to album. For orientation, we've labeled some albums. While, With His Hot and Blue Guitar was released first, All Aboard the Blue Train has enough early Sun recordings for its mean recording date to rank first. At the other end, Out Among the Stars was released posthumously in 2013 as Johnny Cash's last album. However, the songs were recorded in the 1970s positioning it further back in the order of mean recording date. When we plot a trend line, we can see energy as an acoustic attribute generally decreased over time until it increased rapidly and dramatically declined at the end of his career. The album My Mother's Hymn Book, a collection of songs from Johnny Cash's mother's gospel repertoire, marks the sharpest decline in energy. The next, American Recordings, was the first Johnny Cash release on Rick Rubin's label. Notice there's not much difference in energy between American Recordings and My Mother's Hymn Book. When Rick Rubin approached Johnny Cash to pitch a recording project, he sold him on the idea of performing alone. As result, for the early American Recordings sessions, Johnny Cash performed by himself and recorded his voice and a single acoustic guitar. While these powerful songs and the first American Recordings release represent a dramatic turnaround in Johnny Cash's career, the light instrumentation and relatively sparse acoustic space translates into a lower energy attribute compared to other recordings. This quality, however, links these two albums and helps us understand their relationship given they were released over ten years apart and targeted two different listening audiences. We can develop an even more detailed picture of Johnny Cash's musical evolution when looking at higher level acoustic qualities like valence, which describes the musical “positiveness” conveyed by a song. Songs with high valence generally sound more positive. Low valence indicates more somber emotional qualities. As an example, the following tracks represent Johnny Cash's ten most "valent" songs. 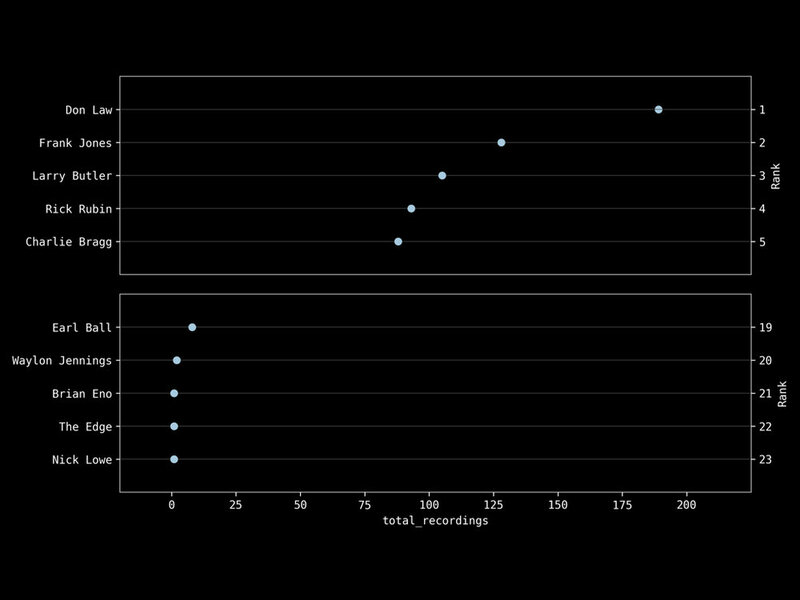 When we plot average valence by mean recording date, we get the following. We can see Johnny Cash’s albums tend to move toward a darker emotional tone. Also notice the albums with the highest and lowest average valence bookend the sequence of albums when ordered by average recording date. In other words, he began his career with his happiest sounding material and ended with his most serious. It’s debatable how influential producers have been in Johnny Cash’s career. Some of his projects, like American Recordings, would have never existed without the producer. But some argue Johnny Cash’s producers only created opportunity for Johnny Cash to do what he wanted and stepped aside. The above plot ranks the top and bottom five producers by total recordings. We can see Don Law produced the most recordings. Some producers share credits which is why we see Frank Jones close behind since he was an associate producer on most of Don Law produced material. We can also see a few one-off productions with Nick Lowe and The Edge. Let's look at the relationship between produces and valence. We'll mark each Johnny Cash recording with a thin vertical line ordered by initial recording date. 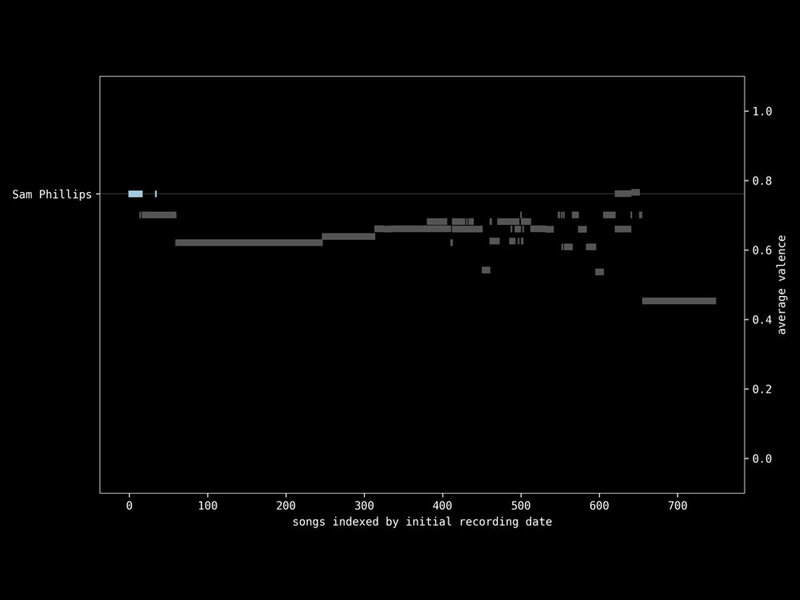 Next, we'll group the recordings by producer and plot the average valence. The highlighted recordings represent all Johnny Cash recordings produced by Sam Phillips. The average valence of those recordings, 0.76, positions those recordings with the most positive sounding groups. At the other end, Rick Rubin, who recorded the last commercially available Johnny Cash music, has the lowest average valence at 0.45. When we plot the trend line through these averages, it’s very similar compared to average valence by album. The balance of creative pull between producer and artist was likely tipped in Johnny Cash’s favor. But areas where we see the most change in the emotional qualities of his music are clearly marked by the highlighted producers. Rick Rubin is especially set apart from the overall group. While people close to the recording process say producers usually got out of the way of Johnny Cash and let him do his thing in the studio, I think Johnny Cash earned his creative latitude over time. We know Sam Phillips made big decisions for Johnny Cash. For example, he would not record Johnny Cash’s gospel music. Jack Clement also incorporated musical elements that represented his own signature style. But the premise of the American Recordings project, at least at first, was total creative control. And we can see when given the freedom to do what he wanted, the audible qualities of Johnny Cash’s music took a much more serious tone. If you read Part 1, you know Johnny Cash's lyrical themes remain generally consistent across his creative work. But why does the audible mood tend to change in one direction? First, Johnny Cash is consistently described by colleagues as creatively restless. He challenged conventional formats with his concept albums. He recorded live in prisons. He even recorded comedic and children’s albums. It would be really surprising if we saw no substantial change in his sound and style over the entire course of his career. Second, he found a way to return to his original inspiration, his mom, his friend Jesse Barnhill, and the sounds of rural folk, country and church music he experienced in Dyess, AR in his early childhood. Once he reconnected, he didn’t let go. Finally, the sound engineered and designed by early producers like Sam Phillips and Jack Clement may not have been a good match for the messages Johnny Cash most cared about. As he earned more and more creative latitude with his record labels, he had more influence over his creative work and made choices to infuse a sense of realism and a heavier emotional quality. It wasn’t until he met Rick Rubin and took on the American Recordings projects that he finally found a musical sensibility well-matched to the weight of his themes. The key quality of those recordings is the absence of anything non-essential. The American Recordings audience was ready to experience the weight of his content without a cushion of musical ornamentation. Considering he lived what he sang, removing layers of production revealed the essence of Johnny Cash music, his truly authentic voice. If you would like to know more about the Johnny Cash Heritage Festival, please visit their site. Here's a list of sources I relied on for this talk. And if you've made it this far, thanks for reading!